Chicago Bears vs. Green Bay Packers free pick for October 20, 2016. Live at CBS from Lambeau Field, Green Bay, Wisconsin. The Chicago Bears enter the game with a 1-5 record, both straight and up and against the spread. The Bears lone win was a 17-14 home victory against division rival Detroit in Week 4, but they’re coming off consecutive losses to Indianapolis and Jacksonville. They’ll take on NFC North rival the 2-3 (2-2-1 ATS) Green Bay Packers at Lambeau Field on Thursday night football. This will be the Packers fourth consecutive home game, and they had defeated the Lions and the Giants before derailing in a 30-16 loss to Dallas last week. The Packers opened as a 9-point favorite, but the spread is now down to 7.5 despite close to two thirds of the tickets coming in on the Packers. The spread is unlikely to move down below a touchdown although Green Bay -7 is likely to be the closing line. The total has dropped one point from the opener of 47, perhaps due to the fact that the under is 6-2 in the last eight meetings at Lambeu. The Bears are coming off a 17-16 setback as a 2.5-point favorite against the Jaguars and gave up the game-winning touchdown with just 2:49 left on the clock. Brian Hoyer was 30-of-49 passing for a total of 302 yards, but no touchdown passes. The Packers are likely to be without their three top cornerbacks for this contest, and their secondary will be under heavy siege from Hoyer, the first quarterback in Bears history to have four consecutive 300-yard passing games. The Bears rank 7th in the league in total yards and 4th in passing yards per game this season. The Bears are 1-4 ATS in their last five Thursday games and 1-5 ATS in their last six games in Week 7. The Packers closed Sunday’s meeting against the Cowboys as a 5-point favorite, and they must be extremely disappointed with the 30-16 outright defeat. 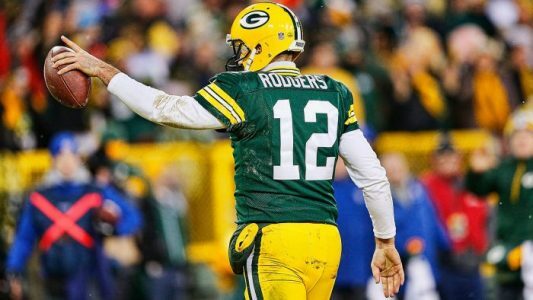 The Packers are 0-4 ATS in their last 4 games following a double-digit loss at home but 7-1 ATS in their last eight games in Week 7. Aaron Rodgers is not throwing the ball well and they rank 25th in the league in both total yards and passing yards. Green Bay has trouble in the back field as well with running back Eddie Lacy nursing an ankle injury. You can follow his status at Rotoworld. Over is 5-2 in Bears last 7 games following a straight up loss. Under is 4-1 in Bears last 5 vs. NFC North. Under is 8-1 in Packers last 9 home games. Over is 4-1 in Packers last 5 Thursday games. Over is 4-1 in Packers last 5 games in Week 7. The Bears offense is not their problem, but rather on the other side of the football. The Packers need Rogers to come up with a big game here on prime time television and we believe he will. Go for a high-scoring game at Lambeu.